The Holiday votive candle by NEST Fragrances pairs the comfort of a traditional holiday fragrance with festive red velvet packaging. An extraordinary scent combination that captures the aroma of the sparkling holiday season is housed in a custom designed glass lightly touched with gold. This collection will bring the warmth of romance of the holiday season into ones “nest”. The glass vases are designed to compliment the beauty of its surroundings; the classic shape and modern stripe etching will complement any décor. Each of the fragrances has been created by the most accomplished perfumers at the world's leading fragrance houses. Votive Candle 57 g / 2 Oz. 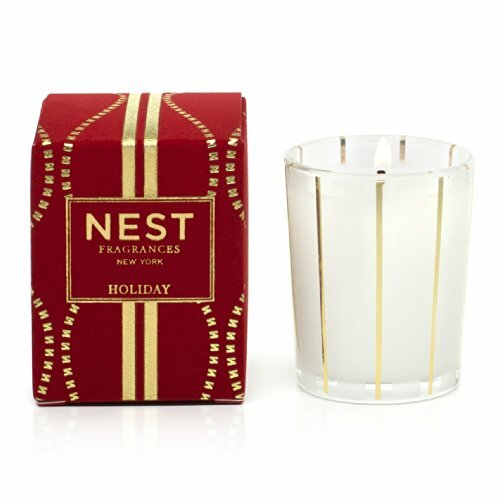 NEST Fragrances Holiday Votive Candle provides the aroma of a sparkling holiday season, which is created by blending pomegranate, Mandarin orange, pine, cloves and cinnamon with a hint of vanilla and amber. Custom designed glass lightly touched with gold.